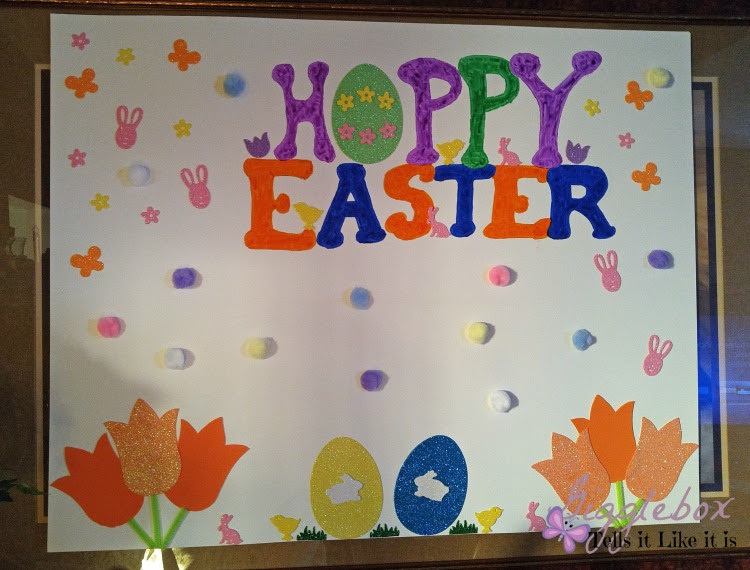 Since the hop the following year was done before Easter, I decided to purchase some of the decorations when Easter items were on clearance. 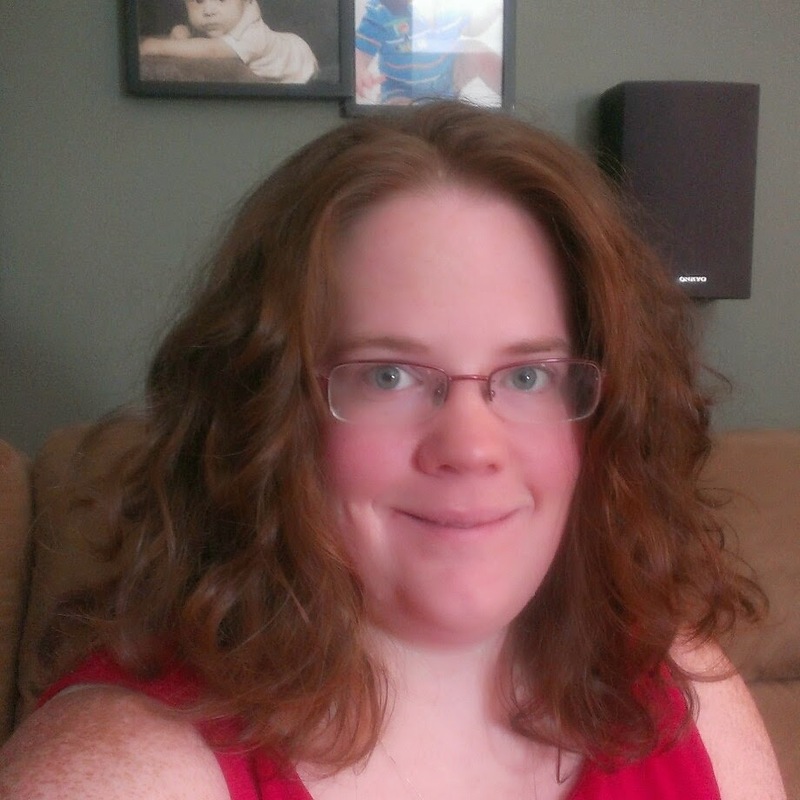 I did buy a few things before last year's hop, but they were from the Dollar Tree so it didn't break the bank. 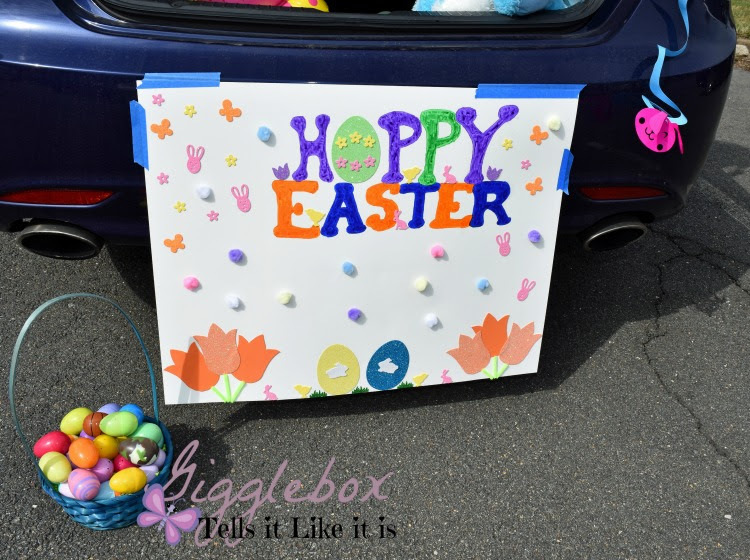 I bought a poster board to make a sign and added some Easter embellishments to it. For the lid of my trunk, I draped an Easter Egg Garland that I made and hung some Easter streamers. I used painters tape to hold the garland and streamers since I knew it wouldn't cause damage to the paint on the car. I also tied the end of the garland to the lid's hinges to help keep them in place. 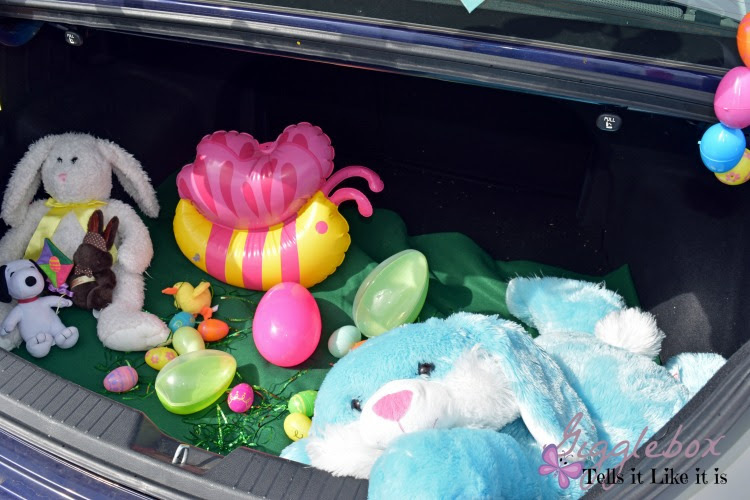 In the inside of the trunk, I placed some green felt to give the look of grass and even added some fake grass used in Easter baskets. I saw a blow-up butterfly at the Dollar Tree and thought that it would add to the Spring/Easter theme I was going for. Sprinkled some extra eggs and added some stuffed bunnies that Michael already had. I attached the poster to my bumper with painters tape. The basket of eggs were the treat filled eggs being handed out to the kids. I ended up just using the eggs that Michael had gotten from the previous year's hop since it was the same amount of kids. 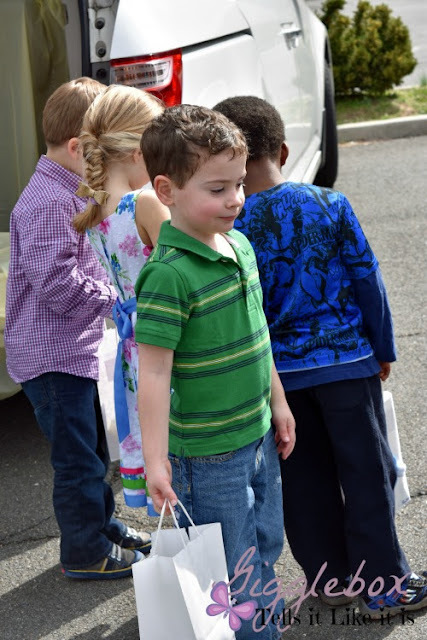 After their Easter party, the kids came out and "hopped" from car to car gathering their treat filled eggs. You could do a lot, but I chose to spend as little money on decorating since this was Michael's last year in preschool. Basically just decorate in Easter or Spring theme and you're set. 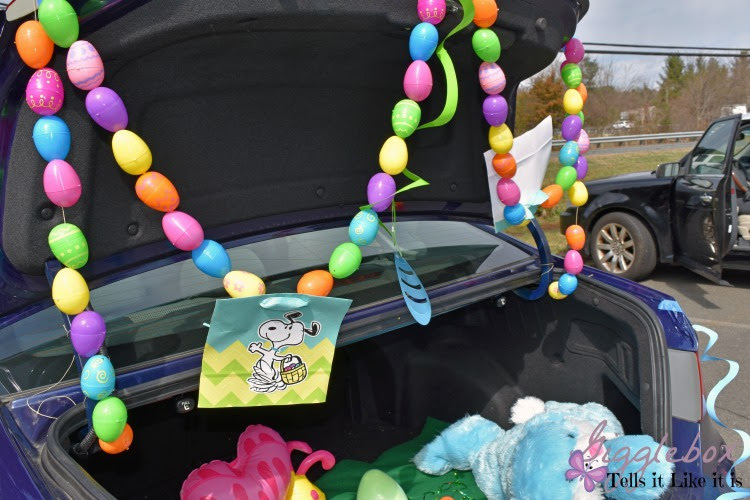 I had thought about using the Peanut characters that we made from our Peanuts Trunk-or-Treat Theme, but couldn't really come up with anything and they wouldn't have worked as well in my trunk. Have you ever participated in a Bunny Hop? 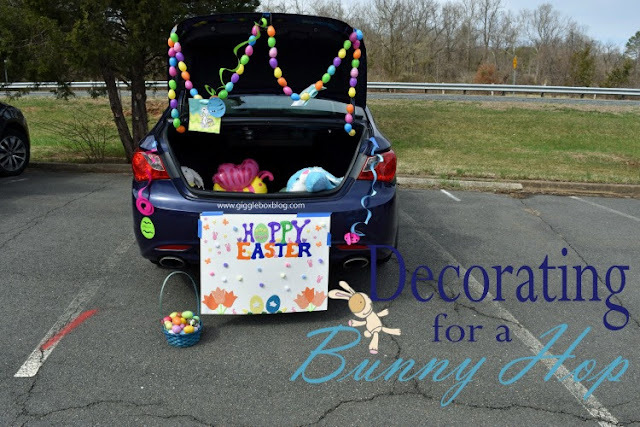 If so, how did you decorate your car?